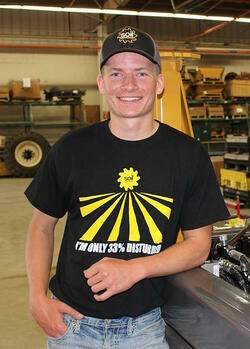 Meet Scott Duban, 2016 Environmental Tillage Systems (ETS) Engineering Intern. A senior at South Dakota State University majoring in Agricultural Systems Technology, Scott spent his summer gaining hands-on agricultural engineering experience through a variety of projects that positively impacted our business. Learn more about his internship experience through the following Q&A. A: In the future, I plan to work in the agricultural industry in some way whether it be in manufacturing, agronomy, or farming. A: As the engineering intern this summer, I worked closely with the senior engineer, Scott Opsahl, and design engineer, Henry Kelley. Some of my day to day projects included completing engineering change orders and first article inspections on new parts that would arrive at the shop. One of my largest projects was working with Raven Technologies to update the ISOBUS communication system on the SoilWarrior. I also had the opportunity to work with marketing, designing and building a display fixture, as well as the service team, traveling to assist in repair work. A: The biggest highlight of my internship was the knowledge I gained working with an original equipment manufacturer. From engineering and marketing to sales and service, I gained professional experience in how each department must correlate to produce a top-notch end product for the customer. Q: Why did you choose ETS? A: I chose ETS because of its proximity to my hometown, and I also wanted to be involved in the making of a high-tech, future forward, piece of agricultural equipment. A: Some specific skills I gained include CAD modeling, schematic drawing, hydraulics, ISOBUS communication, as well as communication and professional skills with coworkers. Q: Why would you recommend the internship to other students? A: I would highly recommend the internship to other students looking for a great experience. The knowledge I’ve gained over the past summer is invaluable and working alongside an awesome team at ETS made it a plus too. Learn more about our current job and internship openings.